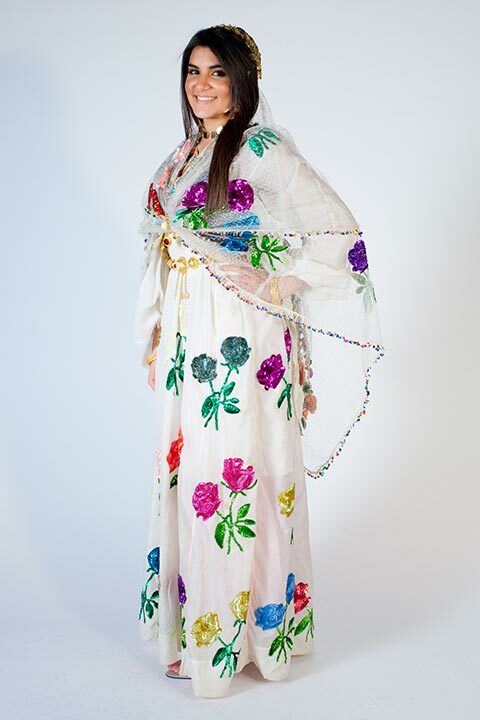 This wedding dress is owned by Saeeda Farida Naqshbandi, who wore this for her wedding in 1970. Baggy trousers (Awal-krass) are worn under the dress (Krass). The trousers are made from any thick fabric, printed or plain. The Awal-krass shown here is made from a pink, plain shiny fabric called Surma. A thin slip (Jear-krass) made of cotton is worn over the baggy trousers. It is usually black or white. 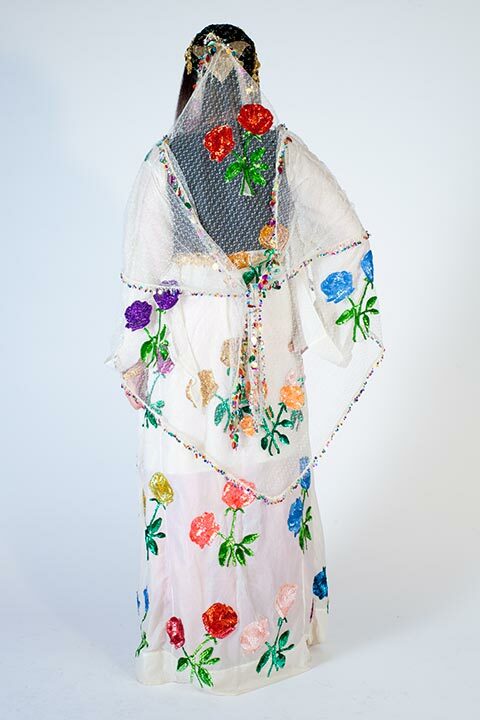 This dress (krass) was worn as a wedding dress in 1970. It is made from taffeta and net. The sleeves are long with a triangle shape at the end. 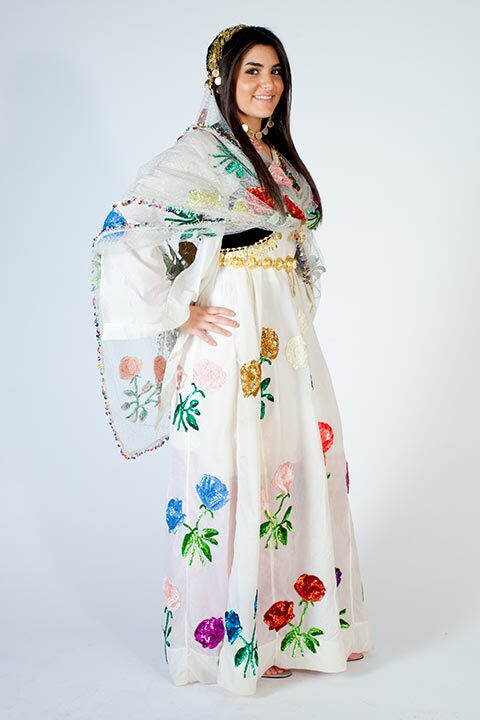 The embroidery on the dress (krass) and shawl (Dassmal) is hand-stitched. The shawl is triangular and attached at the back to a small black velvet hat. The black velvet bolero (Yalak) is worn with a number of pieces of gold jewellery. Sar-parcham – thin gold strands with gold flowers attached (see jewellery section) are worn around the edges of the bolero. A piece of jewellery called Dugmao Dolab is worn across the bolero and clasps the jacket together. It is made of gold and semi precious stones. The gold belt shown is called Pishtweni-Qoba. The version shown here is a smaller kind, versions are also made with larger half circles. The belt may also be made from silver. East Kurdistan, mountainous region. The most famous Kurdish musicians (Mazhari Xalaqi, Nasari Razazi, Kamkars, Shahin Talabani) come from Sinna.